Enjoy a pint, glass or mug at notable spots around Arizona. Native Tucsonan Bryn Bailer is an award-winning journalist, former newspaper reporter, current-affairs junkie, and a firm believer in indecision. (At least she thinks so.) Her work has appeared in various publications, including The Dallas Morning News, Arizona Highways, Arizona Daily Star, international news service Agence France-Presse, scads of lifestyle magazines, and curiously, the English-language financial magazine Czech Business Weekly. You can find a cup of joe or a beer pretty much anywhere. Savoring caffeine or cocktails in style takes a bit more work. Fortunately, Arizona has its share of trendy coffee shops and bars. Here are a few local favorites. Hotel Congress has been welcoming Tucsonans and out-of-town visitors for nearly 100 years – first as a hotel for 1920s-era train travelers and, more recently, for fans of live music and nightclubbing. The hotel houses no fewer than three bars: a chic lobby bar staffed by inventive cocktail mixologists; a massive, antique mahogany bar (replete with fluted columns) in the lively nightclub; and the neon-lighted Tap Room. In Northern Arizona, you’ll find The Spirit Room, in Jerome’s Wild West-era Conner Hotel. 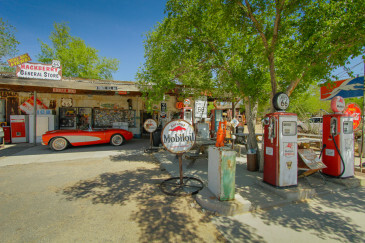 Jerome, once a rough-and-tumble copper-mining camp, has refashioned itself into an artists’ colony – and The Spirit Room is a great home base for the town’s many music festivals and art walks. The bar often features open-mic nights and live music. Style-conscious downtown Phoenix is where you’ll find the glossy Bitter and Twisted Cocktail Parlour. Located in a historic building that, ironically, once housed Arizona’s Prohibition Department, B&T prides itself on serving top-shelf spirits, premium bitters and tonics, hand-carved ice and standout bar food, like the Ramen “Momo” Burger, which features a bun made of pan-fried ramen noodles, and the infamous dumpling burger. Down in Southern Arizona, in picturesque Bisbee – another mining ghost town that repurposed itself as a quirky arts community – you’ll find that good things do come in small packages. The compact Room 4 Bar (so named because it has room for exactly that many bar stools) lies smack in the middle of the historic and once-rowdy Brewery Gulch and often features live music on its spacious patio. Look for it inside the modest Silver King Hotel, which is itself a former miners’ boarding house. Bisbee doesn’t disappoint when it comes to coffee shops, either. The Bisbee Breakfast Club does serve up java, along with eggs, omelettes and other morning fare. Its generous portions, vintage interior and homemade, sky-high cream pies are what keep bringin’ guests back. The BBC also has locations in Mesa and Tucson, but you’ll want to visit the original, located on the lip of Bisbee’s Lavender Pit Mine. Cycling and carb-loading go hand in hand, and at Trailhead Bike Café in north Phoenix, you can service your bike and stomach at the same time. Some customers kick back at the café while their bike is undergoing repairs, and since a lot of cycling rides start and end there, many stop in for a pre-ride snack, or fill up on hardier fare afterward. The café is open seven days a week, and you don’t have to be a cyclist to nosh there. In Tempe, the young Arizona State University crowd predominates at Cartel Coffee Lab, which has a minimalist interior design scheme and stripped-down, straight-ahead coffee-and-tea menu. It can be difficult to find a seat here, but the award-winning, house-roasted coffees make it worth the trouble. You can also find satellite Cartel coffeehouses in Scottsdale, Tucson, downtown Phoenix and Phoenix Sky Harbor International Airport. Last, but not least, downtown Tucson is home to Sparkroot Coffee Bar + Fare, an industrial-chic coffee shop located across from Hotel Congress. It features a generous menu of coffees and small plates; a fun, split-level loft; and wide windows where you can watch Congress Street come alive after hours. In addition to espresso, single-origin and iced coffees, it also purveys teas and flavored sodas. The café rocks a sophisticated vibe that feels more San Francisco than Old West. Editor's note: Sparkroot announced in late 2016 that it will close and reopen as a new location for Cafe Lucce. The article was most recently updated on January 28, 2018.